One of the nice things about Cart66 is that you don't have to have a special e-commerce theme to use it. It works with the theme you already have. The catalog shortcode embeds a nice grid based view of your products directly into the theme you are already using. 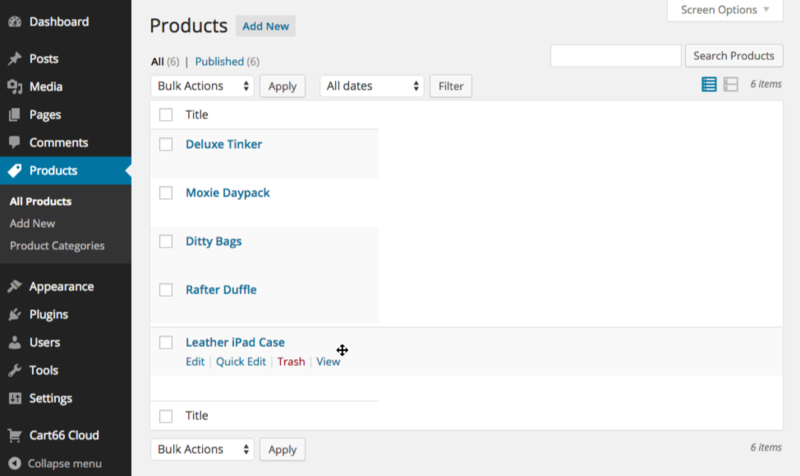 There are some really nice features of the shortcode for sorting and filtering your products. The name of the page and the permalink (slug) are completely up to you. All of the parameters are optional. If you do not provide a specific value, the default value will be used as described below. title: The title you would like to display over the catalog. limit: Disable paging and limit the number of products displayed to the given number. Sometimes you only want to show a catalog if there are products to be displayed. For example, if you have a section on your home page devoted to featured products, but you currently don't have any featured products, you might not want to display the title over the catalog. In that case you can provide a title in the shortcode that will only be displayed if there are products to be shown. The title will be displayed in an H3 tag with the class cc-catalog-title similar to this. You may want to just show the first few items in a catalog. For example, you may want to list the first 3 products in a particular category on your home page but you don't want people paging through all of the products in that category right there. You can list just a few products on your home page and then provide a link to a separate page to view the whole catalog. Drag-and-drop sort your electronics products putting your most popular products first. Title the catalog view something like "Popular Electronics"
Electronics: A listing of only the products in the electronics category. 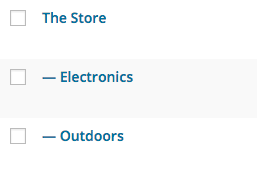 Outdoors: A listing of only the products in the outdoors category. 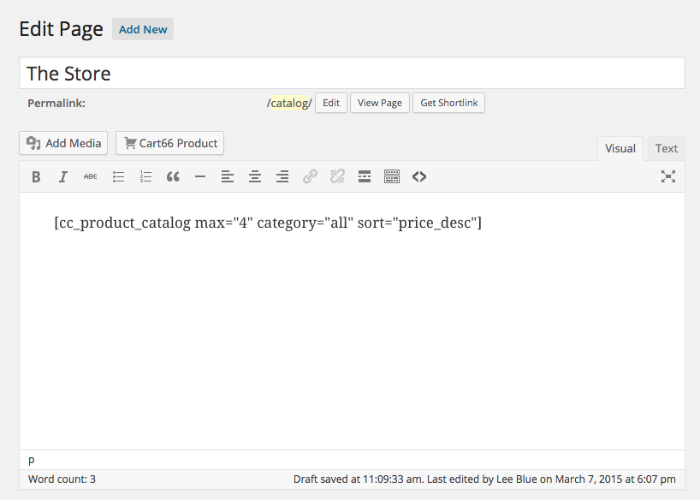 Cart66 products can be organized into product categories just like any normal WordPress post. When editing a Cart66 product, just select the category to which the product belongs. If you'd like to manually control the display order of the products in your catalog listing you can specify menu as the sort value (or leave out sort since menu is the default value). 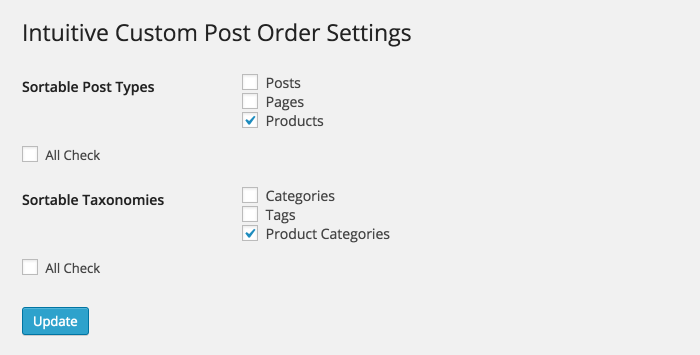 Then, install the plugin Intuitive Custom Post Order. 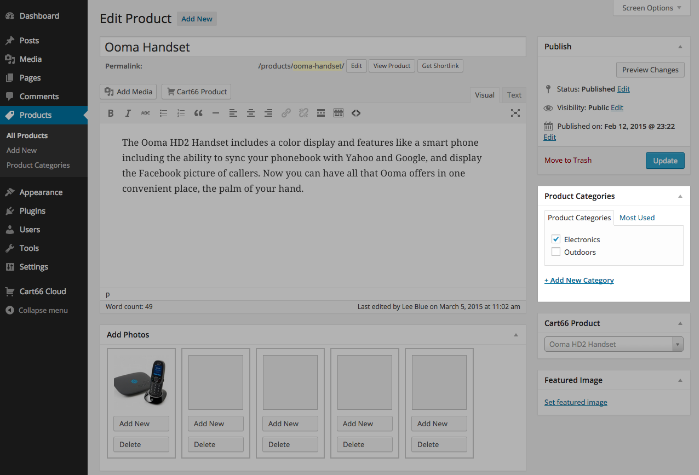 Once installed, you can easily drag and drop the product pages. 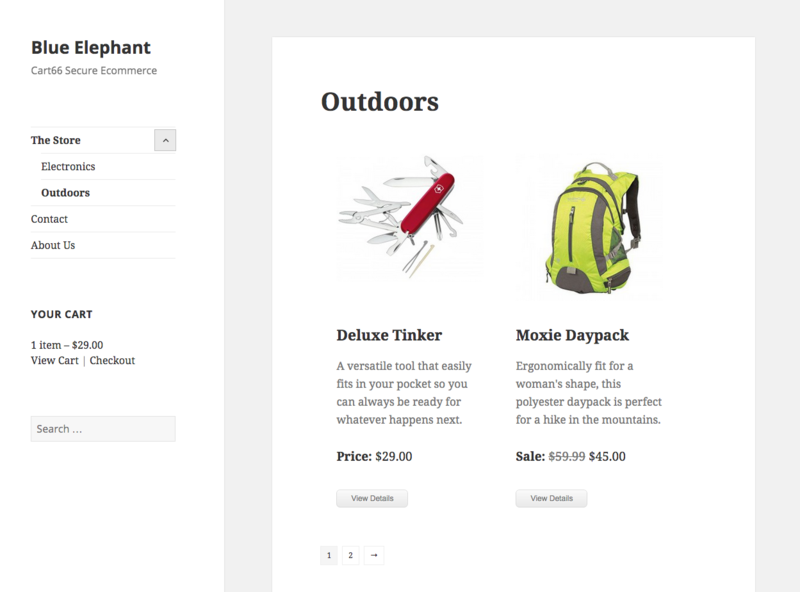 Here is a view of the WordPress Twenty Fifteen them showing the Cart66 Catalog view of the Outdoor products in our store.